Omaha is ready to welcome fans for two days of adrenaline-pumping-edge-of-your-seat-lose-your-voice-screaming entertainment. As four of the nation’s best college basketball teams sweep into Omaha and battle for a coveted spot in the finals, Omaha is ready to keep the action going outside of the arena. In between cheering throughout games, explore a city filled with world-class attractions, legendary food, and a buzzing craft brew scene. When it comes to basketball, Omaha is an easy layup. Continue planning your visit to Omaha for the NCAA® Division I Men’s Basketball Championship. 2. Celebrate Sweet Basketball Greatness at The Capitol District - Omaha’s newest entertainment district is celebrating Sweet 16 basketball all weekend long. No tickets? No problem, with games playing on a large, outdoor screen. Food trucks will dish local eats, bars will offer drink specials, and guests can take advantage of the open container option in the plaza. 3. Get the Meat Sweats and Go Home Victorious - Give your inner athlete a true workout when you take on the mother of all beef challenges. Throw out the calorie counting and bite into the Stellanator – a massive meat mountain weighing in at 4.5lbs and 4,900 calories. Fun fact: More people have been to the moon! 4. Sip on Omaha’s Buzzed-about Craft Beer Scene - What goes together better than beef and beer? Probably basketball and beer. Omaha’s got it all! Omaha’s craft brew scene is in a league of its own with more than a dozen breweries developing unique concoctions for every palate. Insider tip: Before making the trip to Omaha, request a free Omaha Craft Brew Penny Pack and get coupons good for BOGO for a penny beer at 12 participating breweries. 5. Explore the Great Outdoors - That inner athlete will need a workout. Explore Omaha’s outdoors with a hike through Fontenelle Forest, a stroll through Lauritzen Gardens, a challenging mountain bike ride, a peaceful jog, and paddle boarding or fishing at one of the city’s many picturesque lakes. 6. Something for the Carnivores - Eat like a Midwesterner and bite into a juicy Omaha steak. Omaha’s legendary steakhouses will keep your carnivorous cravings at bay as you start your steak pilgrimage here. Whether you want flame-broiled, whiskey-doused or wood fire-grilled – Omaha’s got you covered! 7. Meet Bob! - He&apos;s Omaha’s most eligible bachelor and invites women to walk all over him! Actually... Bob is Omaha&apos;s tweeting, Instagramming, one-of-a-kind pedestrian bridge connected to more than 150 miles of trails. Chat with Bob at @BobTBridge. 8. Hop on an Omaha Culinary Tour - Bring your appetite to Omaha and get a taste of the city one bite at a time. Omaha Culinary Tours offers a variety of walking and driving options for exploring the city’s diverse dining scene. Check for availability and get ready to feast like a local. 9. 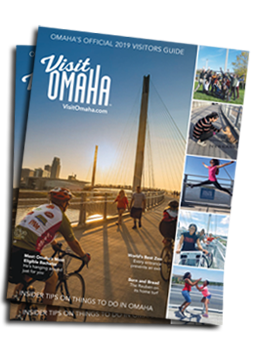 Explore Entertaining Neighborhoods - Omaha is peppered with entertaining neighborhoods filled with eclectic dining, live music, craft beer, and friendly locals ready to point out the next hot spot. 10. Download the Omaha Savings app - Explore 10 of Omaha’s top attractions and save more than $250 with exclusive discounts. Download the Omaha Savings app and save at Omaha’s Henry Doorly Zoo and Aquarium, Omaha Children’s Museum, Fontenelle Forest, Strategic Air Command and Aerospace Museum, The Durham Museum and many more.